BuildIT Blog | The Swiss Army knife of construction software !? "He thought all-in-one software meant "all-is-well" software. He thought wrong." And there's a picture of this frazzled guy in a suit going balistic. I love it, and I agree. Made me think about the landscape of construction software options you are likely coming across in your research. And the opinions offered by the self-appointed professionals (read: sales guys that want to sell you their software) on what you should consider before buying software. For most small to mid sized construction businesses, having one software system that does it all may sound good in theory, but it rarely works. Imagine a mechanic having one tool that does it all - I picture a Swiss Army knife type ratchet that weighs 100 LBS and does as many things. 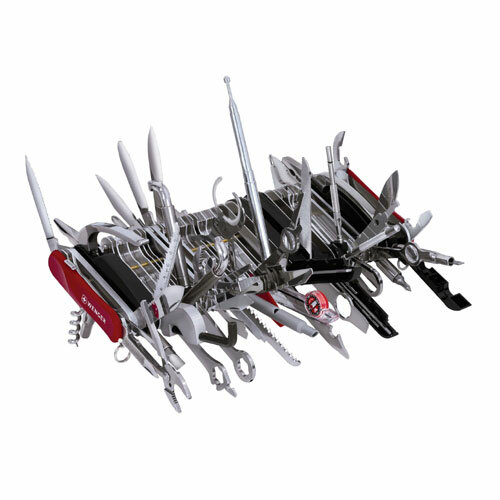 So what about the Swiss Army knife of construction software? If it exists, it has to cover a lot of ground, end to end, all facets of your business. It will be comprehensive, complicated, and come at a high price. And for most construction pros we talk to, most of the time, it's overkill. BuildIT is narrow in focus, by design. We saw the gap in construction software back in 2000 and how an Internet accessible system could span that gap. So we only focus in 3 main areas: scheduling, file management and communications. We didn't see the need for more/better construction accounting software. Quickbooks (contractor edition) has been around for some time, and is used by the majority of construction pros that have connected with BuildIT. It's a "back office" system, done offline typically, and by a bookkeeper or consultant. As for estimating software, we make recommendations but again, most are using a spreadsheet that they have developed... and we're not about to build a watered down version of Excel. The gap - managing the details, the scheduling, the mountain of information that is created throughout the building process, information that needs to be stored, accessed, communicated/shared, and archived. We also realized another thing... a printed schedule is out of date about an hour after it's printed. We knew that construction pros needed more than a pretty Gantt chart on a piece of paper. They need a real time scheduling system that keeps all key people on track, singing off the same song sheet. That is where BuildIT really shines. The system integrates your jobs with scheduling, contacts, and files... all project related information is in one place, stored securely, and accessible 24/7 by the folks that need to see it and act on it. OK, if we're a Swiss Army knife, with 3 attachments, then we're somewhat manageable. Or you can buy construction software like the picture above and spend the next year or two trying to figure it out! Then again, it may be the right decision for your company (there's a buyer for every product out there).